It’s rare but always warming to find a small but meticulous restaurant run by a married couple who are passionate about food, whose day-to-day priority is delighting guests with deliciously unusual taste combinations. We wish we had the whole magazine to write about Philippe, where we enjoyed some Of the finest food we’ve had all year, but we’ll have to try to do it justice in just a few paragraphs. One of the co-owners of the hugely successful riga restaurant riviera and her husband have teamed up with a chef who studied at the institut Paul Bocuse in lyons to create a fine-dining jewel in Jurmala, with the lofty aim of becoming the finest in the country. 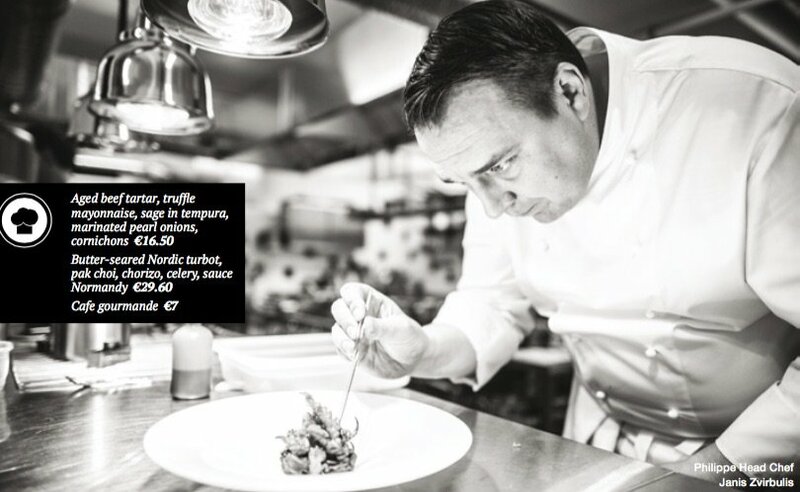 Head Chef Janis Zvirbulis opened the first relais & Chateaux restaurant in russia and has mastered his skills in high-class French restaurants. Yet walking into Philippe it’s clear the décor is elegantly homey without feeling crowded or pretentious. this is a faultlessly renovated wooden cottage dating from the 1880s, originally a pharmacy, with many of the original architectural details retained – timber beams, broad doors, a gorgeous old staircase leading to a second floor reserved for weddings and corporate events. a path leads over the rise directly to the sandy beach, little more than a hundred meters away. The menu boasts the finest in French nouvelle cuisine, with countless ingredients going into a short but mouthwatering menu. the beef tartar alone holds 19 ingredients, some of which are known only to the chef who is given free rein over the kitchen. most sit delicately poised on the long cuboid of cured, raw minced beef – baby pickles, sage and tiny onion rings in tempura, white-truffle mayo, even a colorful edible pansy. Various slices of home-baked bread including a wonderfully spongy caraway rye are served in a basket with spreads and a pat of French butter embossed with the restaurant logo, lest you forget where you are. We didn’t try one of the main courses on this occasion, but we were recommended butter- seared nordic turbot with pak choi wrapped in chorizo. don’t feel timid about ordering the least expensive mains, roasted rack of rabbit (€18.30) served, we were told, with a lusciously leafy swiss chard and other delights. rabbit is often as it most tender after Easter during the year’s most productive season. We moved straight to dessert and were not disappointed by Cafe gourmande. With five sweet seductions on a square-shaped plate, it’s wisest to start at the center with the softest ice cream you’ll ever taste, earl-grey flavored, and made just a moment ago. move out to the corners where you’ll find a tangy lemon tart; a bitter chocolate tart with a glazed macadamia nut on top and a tiny blob of sparkling and edible 24-carat gold leaf on top of that; a classy, hard, dark chocolate with punchy orange filling; and curvaceous almond biscuits. Philippe seems to create desserts like nobody else – pear in wine with chocolate sauce melting all over it, or flaming alaska ice cream with Grand marnier set alight to glow blue in the dark, not to mention aromatic cheeses by Fromagerie mons. the extraordinary blend of grapes in Franz Haas, the uniquely dark and earthy aglianico wines of radici from southern italy, or the lebanese Ksara wines. Bollinger champagne is plentiful, but there’s also an extremely rare Philipponnat dated 1983 going for €1000 – an allusion to the name of the restaurant? If you’re curious as to why framed black- and-white photographs of movie and celebrity legends such as marilyn monroe, audrey Hepburn, Churchill, Hemingway, Hitchcock, dietrich and dali are doing on the walls, they were taken by the man the restaurant is named after – Philippe Halsman, who was born in latvia. Coincidentally, this ties in with both legend, the name of the expensive newly built residences that surround Philippe, and tiffany – the villa’s earlier name, alluding to Hepburn’s most famous movie Breakfast at tiffany’s. and why not come to Philippe for breakfast on sundays – an a la carte breakfast that attracts families and couples. anyone who visits, at any time, is certain to stay for hours.